As I write, I’m eating English Muffins slathered with hot butter. Mr Cookingfanatic is out at church, and I’m getting ready to watch a documentary on the Queen. In short, it’s a quintessential Sunday evening English scene from a bygone era. Also (unfairly) relegated to the category of a bygone era is stew with dumplings. They have a reputation for being stodgy, but in fact they should be delightfully fluffy and light inside. This recipe was adapted from a couple on the bbc website and bbcgoodfood. I made it serve 4, but it wasn’t massive portions. The casserole is deliciously sweet and the pork very tender. I didn’t have high hopes for the recipe, but it was excellent! 1. Preheat the oven to 180’C. Heat the oil in a casserole dish and fry the pork until brown (about 5 minutes). Add the chopped garlic, and paprika, mix well and fry for another couple of minutes. Then add the stock, chopped tomatoes, and sugar. Bring to a simmer and stick in the oven for two hours with the lid on. Check on it occasionally and top up with boiling water if needed. 2. When the two hours are nearly up, chop the peppers into chunks. Make the dumplings: Mix the flour, baking powder, salt, suet and herbs in a bowl, and add enough water to form a scone-like dough. You’re not exactly baking a cake, so don’t worry if you need to add a little extra flour if it gets too sticky. Roll into about 16 little balls. 3. After the two hours, add the pepper chunks and stir well. 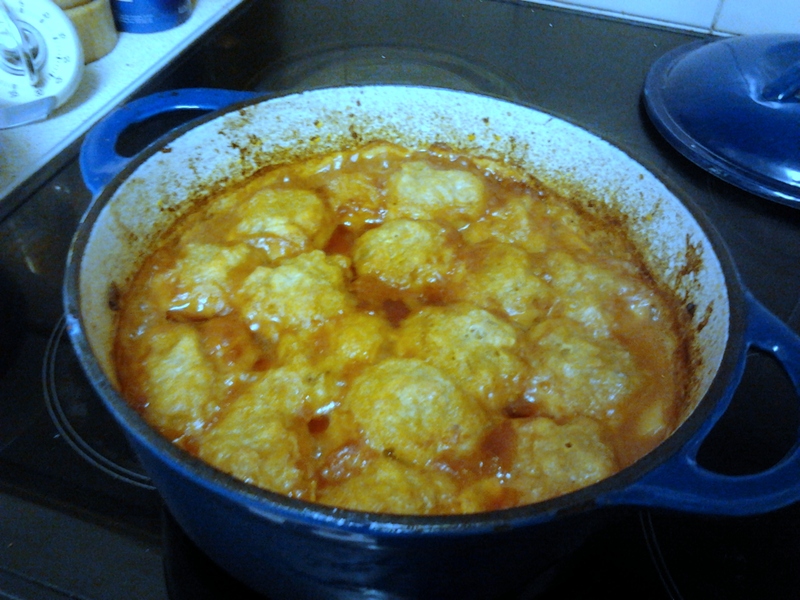 Then pop in the dumplings on top and put the lid back on. Put back in the oven for about 15 minutes, then take the lid off and bake for another 10 minutes, to get a slightly golden top to the dumplings. Serve the casserole with peas and soured cream to garnish. Next PostNext Easter – all about the eggs?